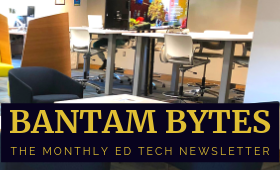 Home / Moodle / Common Questions / What can students or my TA see and do in Moodle? You can easily switch views to see what students, TAs and other types of participants see in your Moodle course. 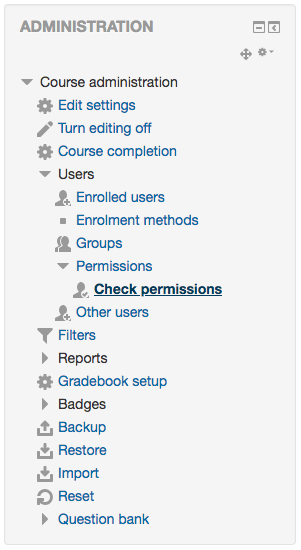 Once any course is visible to students, you can check visibility permissions under the “Administration” box. 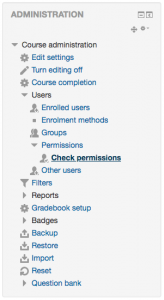 You can check what your students and TAs can see with their role when you use the “Check permissions” option, under “Users” and “Permissions”. Then, you can simply select a specific user and choose the “Show this user’s permissions” option to view their roles and permissions.